Military Cross recipient and Ulster Unionist Party MLA Doug Beattie MC has called on the PSNI to provide an assessment in relation to dissident linked Conflict Resolution Services Ireland. 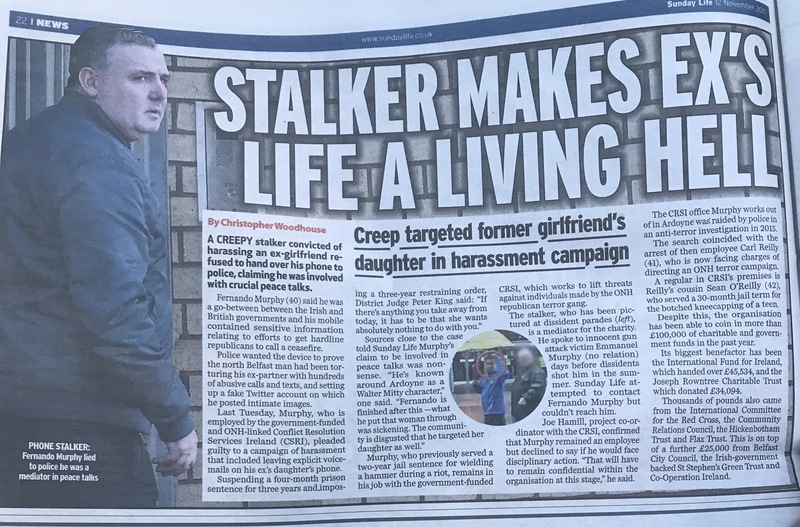 The call comes after the conviction of thuggish stalker Fernando Murphy, who last week pleaded guilty to stalking a former partner which included places stolen photos online and setting up fake twitter accounts spreading false and malicious lies about the woman. Sunday Life reported the conviction in Sunday’s paper. “The article in the Sunday Life raises a number of serious issues. Firstly, the story alleges that CRSI is linked to Oglaigh na hEireann (ONH); therefore, I have written to the PSNI to ask them to carry out an assessment of this claim. I believe it is firmly in the public interest to have clarification provided in the same manner as was provided for CharterNI. “The report also outlines Mr Murphy’s recent and previous convictions and given that the organisation he works for is cited as dealing with vulnerable people, it is vital to ensure that the rigorous checks have been completed. “With this in mind I have also asked the Board of Trustees for clarification on whether Mr Murphy has been subject to an AccessNI check and have written to the Joseph Rowntree Trust, International Fund for Ireland and the Community Relations Council regarding the mechanisms and checks they have in place for the awarding of public money. The board of CRSI have previously come under pressure due to reports in the local media that Fernando Murphy and another employee had forged a ‘drug dealer list’ and played a key role in the attempted murder conspiracy which lead to the shooting of innocent man Emanuel Murphy (no relation). Despite Murphy and CRSI’s well reported role in the attempted murder conspiracy the PSNI failed to arrest Mr Murphy or raid the offices to seize relevant computers. It is not clear why. 67 Responses to "NEWS: UUP MLA Doug Beattie calls for a PSNI assessment of CRSI following stalkers conviction "
a good web hosting provider at a reasonable price? Many thanks, I appreciate it! hopes to find out about this topic. You know so much its almost hard to argue with you (not that I actually will need to…HaHa). service. Do you’ve any? Please let me know so that I may subscribe. they’re discussing on the internet. You actually know how to bring an issue to light and make it important. Hi to all, it’s truly a good for me to visit this web site, it consists of precious Information. soon. I want to encourage you continue your great writing, have a nice evening! I take pleasure in, result in I discovered just what I was looking for. weblog link on your page at appropriate place and other person will also do similar in favor of you. other people I have read stuff from. Thanks for posting when you have the opportunity, Guess I will just bookmark this page. Thank you, I’ve recently been seeking for information about this subject for ages and yours is the best I have discovered so far. This article provides clear idea in favor of the new viewers of blogging, that really how to do blogging. The whole look of your website is great, let alone the content material! to produce a top notch article… but what can I say… I put things off a lot and don’t seem to get nearly anything done. I wonder how so much effort you place to create this sort of magnificent informative web site.
) I handle such information a lot. I used to be seeking this particular information for a very long time. post. Thank you a lot and I’m having a look ahead to touch you.